Description: It’s Thanksgiving, and we’d like to extend our thanks to all players who have enjoyed and shared the game with others with this new event. Help us reach a certain number of Likes on the official Eternal Saga Facebook page and be rewarded. The more likes we get, the better the rewards! More info available here. Description: A large rafter of wild turkeys has swept through the land, scattering their feathers throughout Demonhunt, Scimitar Valley, Molluscan Alcove, Elphame, Shadow Keep, and Demonsburg. For the following week, these Turkey Feathers can be collected and used in the Forge to create Dragon Shards, Soul Shards, Moon Essence, and special Thanksgiving Packs. Note: Thanksgiving Packs contain Mid-lvl Purse x1 and Heart of Gratitude x1, which can be used to obtain special buffs. 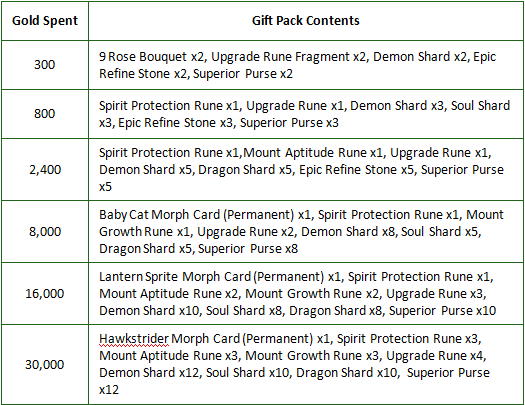 If you’re lucky, your Thanksgiving Pack may also contain Monster Morph Pill x1, Demon Shard x1, Mid-lvl Purse x1, or Epic Refine Stone x1. Description: This Black Friday deal is a little bit special: it’s good for the entire next week! For the duration of the event, ALL players will get a 20% discount on items in the Clearance section of the Shop. Note to VIPs: this stacks with you current 20% discount! Note: Rewards can be redeemed by clicking the “Timed Rewards” icon in the top-right corner of the screen. Purchases made in the Market or with Gold (Bound) are not include.